Birding Is Fun! : Another Avimor First! I'm gearing up mentally and physically for tomorrow's Christmas Bird Count at Deer Flat National Wildlife Refuge and went out this foggy morning to practice the CBC strategies mentioned on the great Bird Fellow blog. I went to the Avimor entry bridge which gives me a good above-view of Spring Valley Creek. By pishing and playing a Northern Pygmy Owl hoot I was able to see Song Sparrows, American Goldfinch, and even a Downy Woodpecker stopped by to investigate. Can't we all agree that Song Sparrows react to just about any bird sound and will curiously pop up in plain sight?! I know we have wintering Spotted Towhees here at Avimor that will lurk in the thick underbrush because I had them last winter. I played its call, but no response. Then I got to thinkin'...there's another little winter bird that I've never seen before that this habitat should be perfect for; shaded, damp, and fallen trees. I've been reading about it a lot recently as it may be a species split between the western and eastern varieties. I played its call five times and then just listened and watched for 15 minutes. Dark-eyed Juncos and a Northern Flicker whizzed by, but still no sign of the little bird I hoped to see. I gave up and started walking back toward my office...when I heard a faint keep-keep that was just different enough that I knew it wasn't a Song Sparrow. I went back to the bridge slowly and tried to track down with my eyes what I was hearing with my ears. There before my eyes was a cute little brown ball of joy. It reminded me of a mouse as it snuck stealthfully around the low brush and fallen cottonwoods. An Avimor first - the 99th bird officially recorded at Avimor - and my life bird #316: The Winter Wren! This also makes the 4th species of wren observed at Avimor: Rock, Canyon, House, and Winter. I wonder now if the Winter Wren call I have in my Zune BirdJam is an eastern bird or a pacific bird? Well, whatever it was, I suppose it worked! I probably won't be able to call this a "Winter" Wren for long. To read more about the portending species split of the Winter and Pacific Wren, click here. 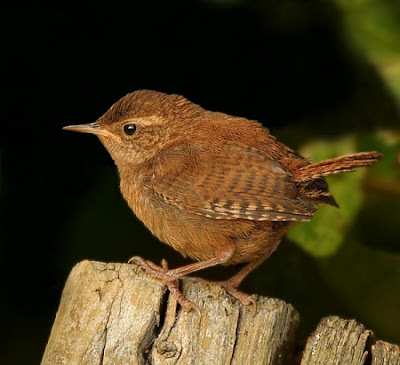 Another great blog about the Winter Wren and a great photo click here for the Pacific NW Backyard Birder. Congrats on the new bird. I don't think I have ever seen one.